Spring planting has long given way to summer, and the garden is now in full as we finish planting for next season. Above: Masai haricot verts, or filet beans. 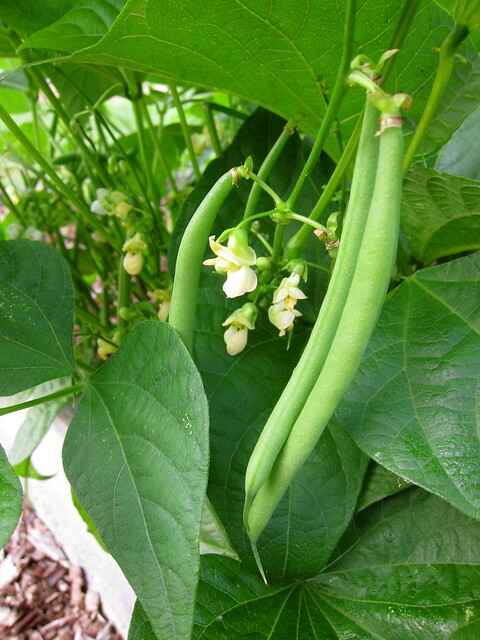 Originally French-bred, they’re a more slender version of green beans, and are full-flavored when picked young. This particular variety is forgiving if you miss a day or two, and will keep on the plant. This is our second year of planting Masai from saved seed. 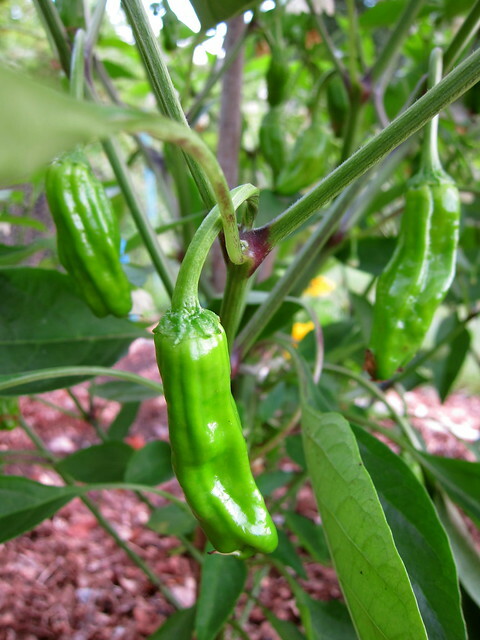 Spanish Padron peppers are delicious simply blistered in a hot skillet and finished with a sprinkle of good salt. The occasional one, however, can be formidably hot, with no warning until you bite down. If you’re not up for pepper roulette, we’ve found that these Shishito peppers make a fine alternative. It’s our first try at growing peppers, and we’re pleased with the results. The Shishito is producing vigorously, enough to concern the Gardener as to what we were going to do with all of them once they were ready. We grilled up the first batch, and knew immediately there was no need for worry, that these were going to disappear from the table quickly. 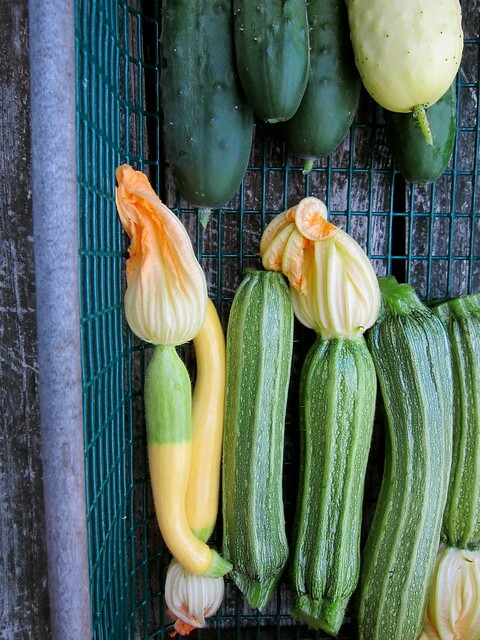 Tromboncino squash is another Italian heirloom we’re trying out for the first time. 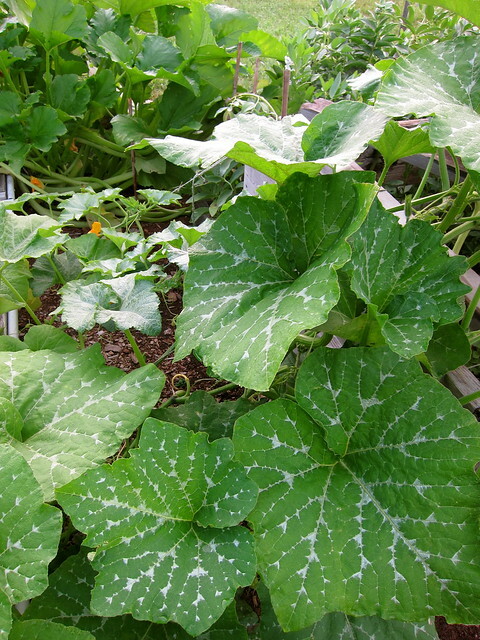 It can be grown as both a summer and, later in the season, a winter squash, and is resistant to powdery mildew and squash vine borer, all qualities that make it attractive to grow in our climate. 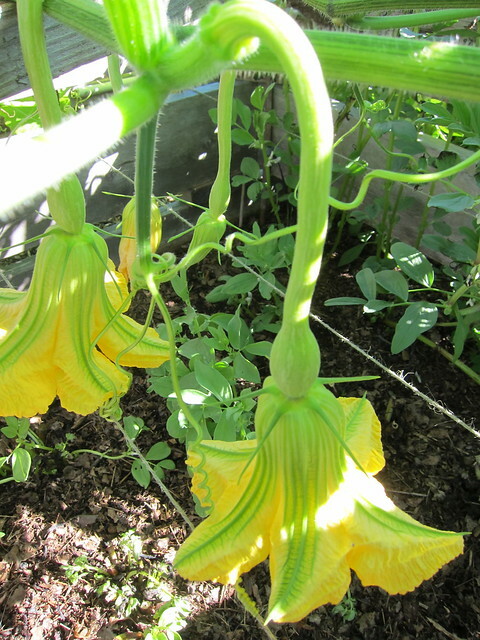 So far, it’s growing at a prodigious rate, living up to its other name, “zucchini rampicante.” The leaves have a beautiful webbing, as if they can barely keep up with their own growth. The greens bed is showing typical signs of August, a little overgrown and undertended. 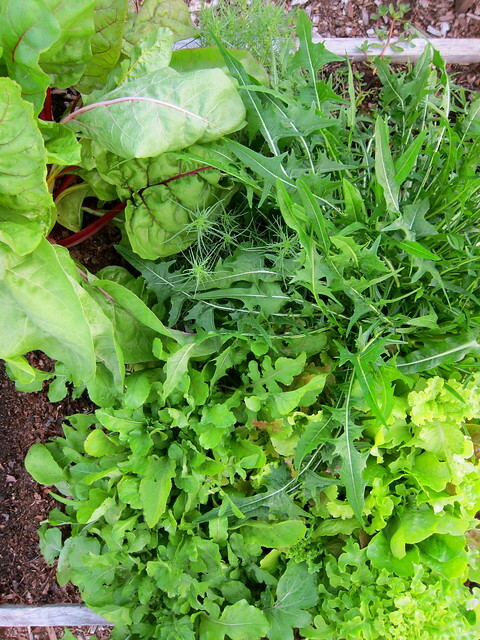 Above, clockwise from upper left: Rainbow chard, agretti, Catalogna Emerald endive, mixed salad greens, and arugula. 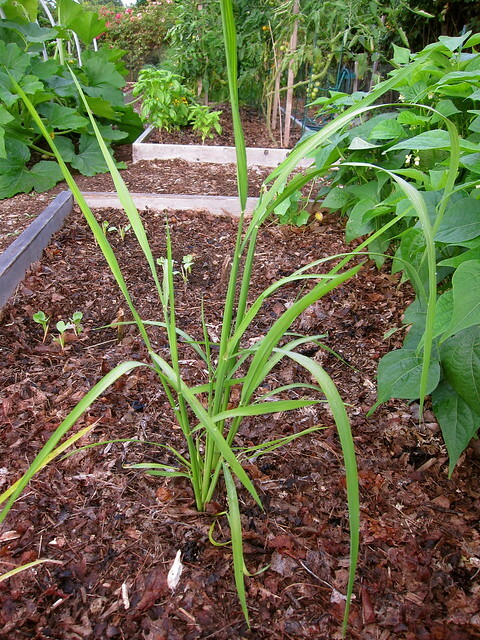 Germinating agretti can be problematic, and we compensated by sowing more seeds than usual. Once it got established, it’s been growing steadily and proven hardy. 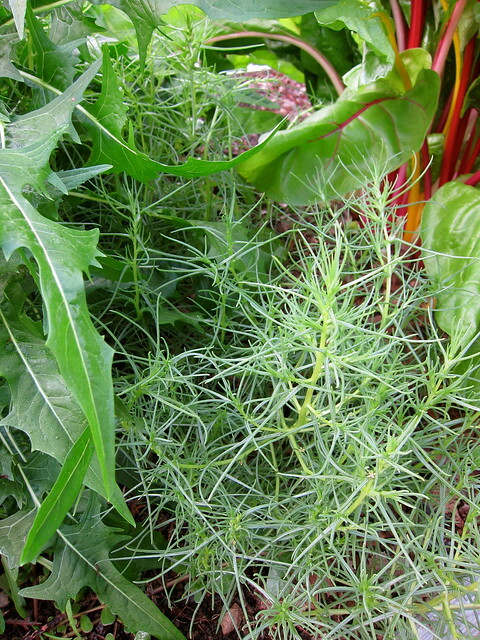 We continue to use it raw in all manner of salads, and have plans to make agretti spaghetti as soon as there’s enough. Erba stella resembles, as one reader described it, a burst of fireworks. 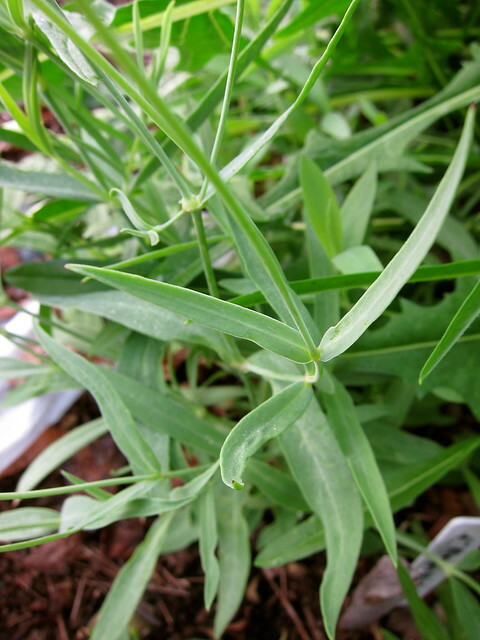 Known as buck’s horn in English, it’s a small plant and, like agretti, may be used raw in salads. The dried leaves may also be used to make teas. 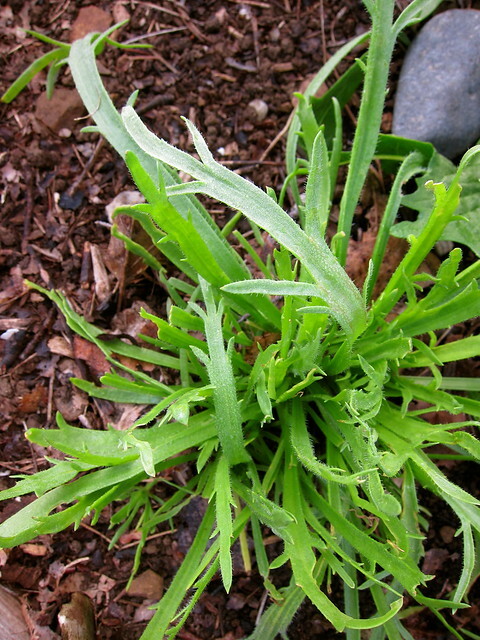 Along with erba stella and agretti, we found scuplit in the Seeds from Italy catalog, where it’s described as “a bit like a combination of arugula, tarragon, chicory, and other herbs.” Scuplit is also used raw in salads, and it’s said to flavor egg dishes and risottos. 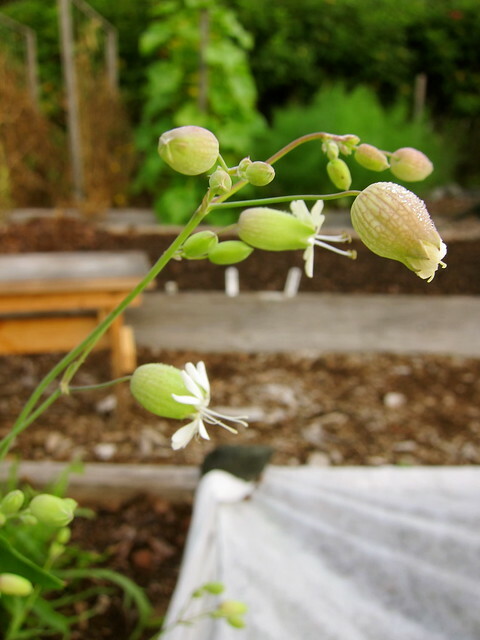 As Barbara Damrosch points out, we know it as bladder campion and, though widely used in Italy, here it’s considered a weed. This is our second attempt at growing Duborskian rice, one of the very few varieties available as seed to nonindustrial growers. 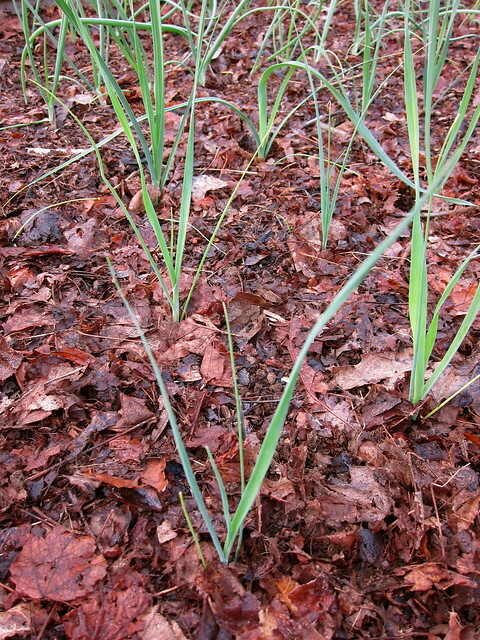 This dry-land type doesn’t require flooding, however, don’t be mistaken, it still needs steady watering. Only one survived of our ten seedlings, and it’s begun to take on a calligraphic form, reminiscent of Asian ink paintings. Based on last year’s success, we’re again growing potatoes in containers — it frees up precious growing space, makes it easier to harvest, and we deposit the soil afterwards. 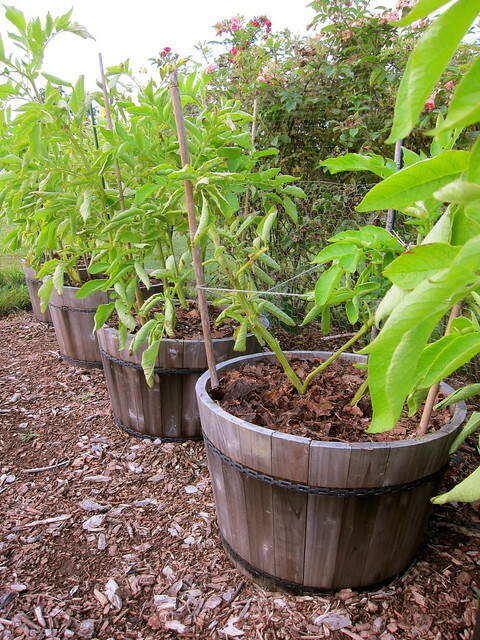 This year’s experiment is about yield, and each container contains a different number of Yukon gold seed potatoes. These won’t be ready to harvest until late September. Above: An overview of the garden — a moment in time and before the squash take over. 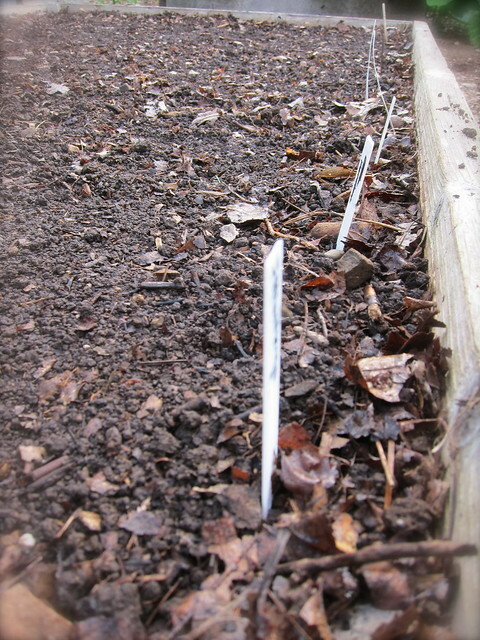 We’ve skipped summer leeks, and planted Siegfried and King Sieg (above, left) for winter use. 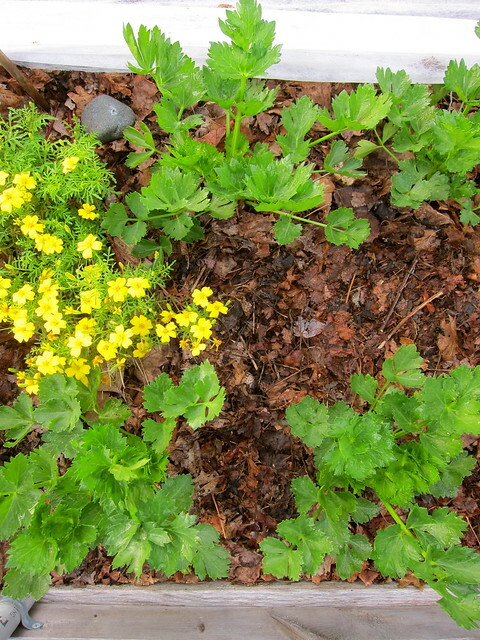 The celeriac (right), called Brilliant, requires 100 days of patient waiting. Masai filet beans, Shishito peppers, Napoli carrots, Perfection and Orion fennel, Boothby Blonde and National Pickling cucumbers, Costata Romanesco zucchini, Zephyr summer squash, Tromboncino squash, favas, Siberian, Beedy’s Camden and Red Russian kales, rainbow chard, sungold and peacevine tomatoes, and salad greens. Putting up: Garlic cured for storage. 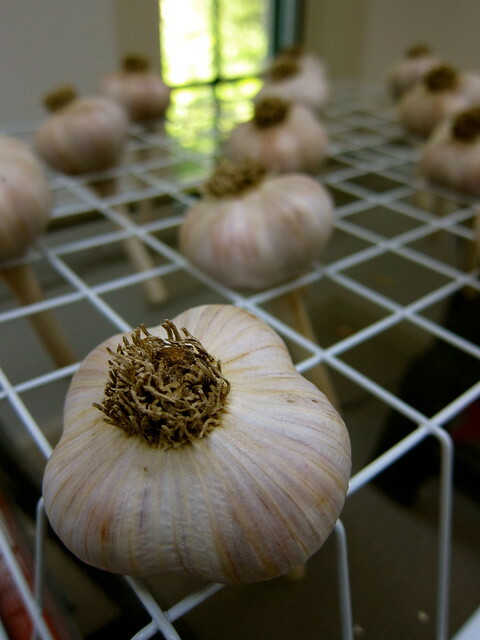 With this year’s garlic crop, we made some changes on how we prepare them for storage. After a week of curing indoors in a warm, dry room, we clipped a portion of the tops off to expose the stalk and allow excess moisture to escape, but left the roots as is. 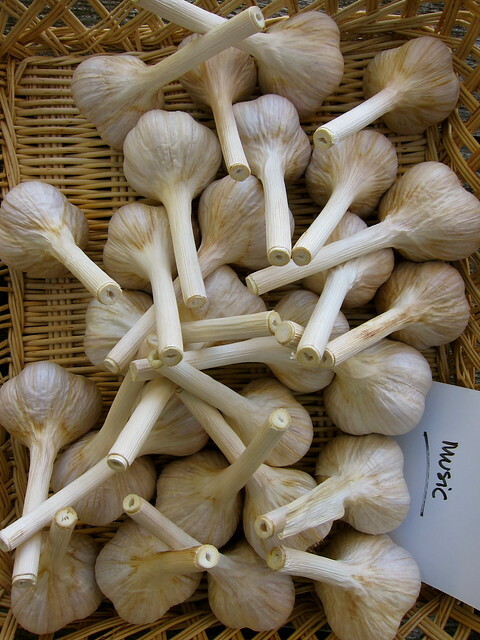 Above: Music garlic after a week of curing. After a second week, we trimmed the stems further, and also the roots. At this point, the Phillips was ready for storage after a couple more days. With their heavier bulbs and stems, the Music required more time to cure. We placed the bulbs in a rack to expose all sides to air, and left them for another week of curing, for a total of three weeks. 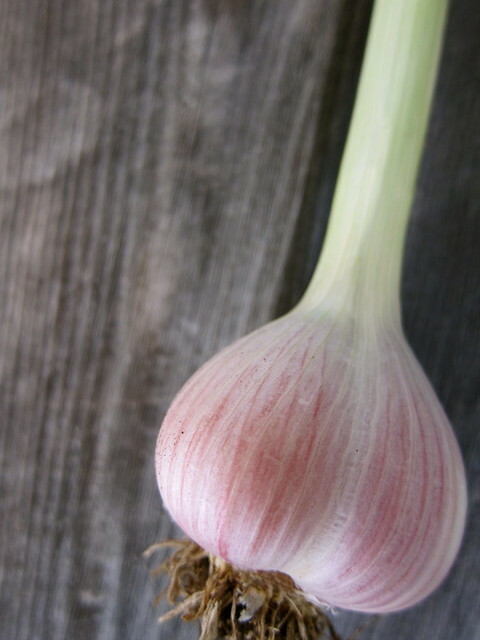 We began growing garlic in 2008, and have planted from the previous year’s harvest ever since. 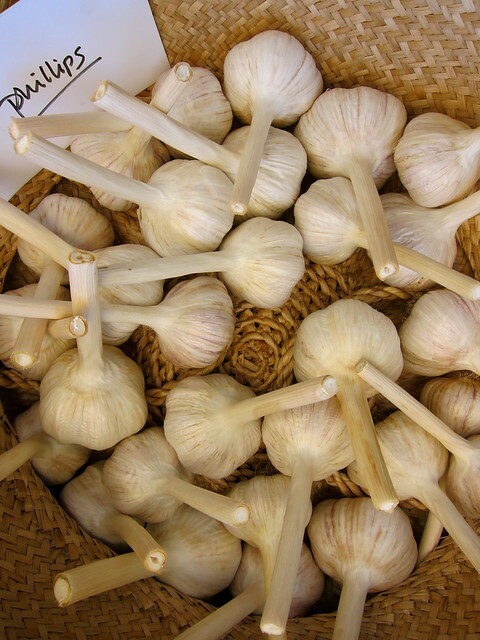 The Phillips garlic started out small and, through selection, has adapted and now produces good-sized bulbs. Above: Phillips garlic done curing after two weeks. Lacinato kale; Fordhook chard; Miyashige daikon, Green Meat, Watermelon, Shunkyo, Japanese Long Scarlet radishes, French Breakfast, and Cherry Belle radishes; tatsoi; Hon Tsai Tai; Puntarelle Stretta, Brindisina, and Italiko Rosso chicories; Cime di Rapa Quarantina. 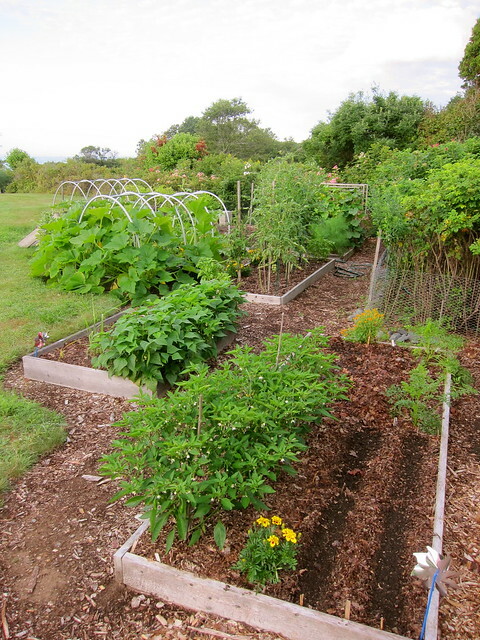 This entry was posted in garden and tagged agretti, beans, celeriac, chard, chicory, cucumbers, garlic, herbs, leeks, peppers, pomodorini, potatoes, rice, salad greens, summer squash, tomatoes, winter squash. Bookmark the permalink. Charming garden. Great photos. Thanks for a wonderful slice of nature. Your garden looks and sounds very successful this year. 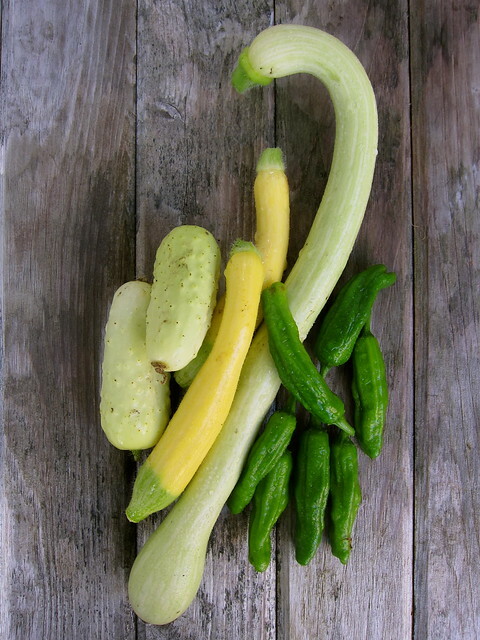 Love your vegetable photos…stunning. Thanks, Karen! 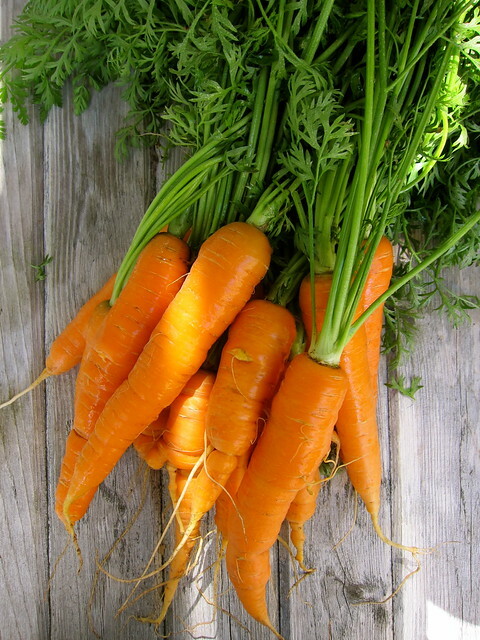 We’ve very much cut back what we grow, to the benefit of the garden and the gardeners as well. And makes me feel connected to all of those who came before us, passing on their wisdom and knowledge. Your garden is beautiful and you are growing so many interesting things, with more interesting things to come this fall. The pointy tomato is very interesting, does “hanging” mean that it is a type where the whole plant is pulled and hung for winter storage? Thanks, Michelle! We can’t grow quite the range that you do, but are always willing to try. 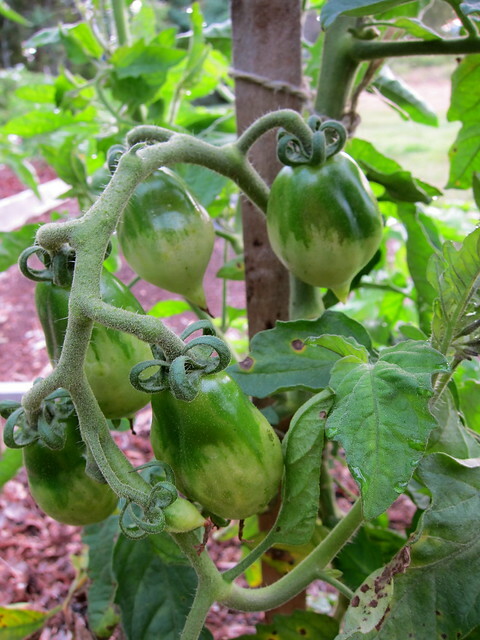 “Hanging” refers to the way these tomatoes are stored, and pulling the whole plant is one way to do this. We opt to store our winter tomatoes in a single layer in open trays with plenty of air circulation. Your plot is as beautiful as any flower garden. Thanks, Ricki — part of the pleasure is making it so! Love your title. You have so many unusual things growing in you garden and everything is doing so well. Looking forward to your garden updates. Thanks, Norma — Many of these were impulse buys, but also a way to learn more about new ingredients that might not be available to us otherwise. And it’s always a pleasure to see your own garden updates! Your garden looks absolutely terrific. WOW. Mine is embarrassing between the slugs, Japanese Beetles, blight; blossom end rot, and squash bugs. You go girl! Love your reports from the garden. What a beautiful space! I can’t imagine the dedication that goes into creating such an orderly landscape. We take a laissez-faire attitude towards the non-edible portions of the garden, but, in the long run, find keeping up with the food-producing ones helps to tamp down weeds, pests and disease!